Seventy years have passed since the tortured inmates of Hitler's concentration and extermination camps were liberated. When the horror of the atrocities came fully to light, it was easy for others to imagine the joyful relief of freed prisoners. Yet for those who had survived the unimaginable, the experience of liberation was a slow, gruelling journey back to life. In this unprecedented enquiry into the days, months and years following the arrival of Allied forces at the Nazi camps, a foremost historian of the Holocaust draws on archival sources and especially on eyewitness testimonies to reveal the complex challenges liberated victims faced, and the daunting tasks their liberators undertook to help them reclaim their shattered lives. 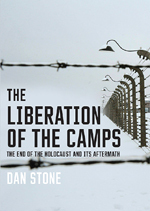 Historian Dan Stone focuses on the survivors -their feelings of guilt, exhaustion, fear, shame for having survived, and devastating grief for lost family members ; their immense medical problems ; and their later demands to be released from Displaced Persons camps and resettled in countries of their own choosing. Stone also tracks the efforts of British, American and Russian liberators as they contended with survivors'immediate needs, then grappled with longer-term issues that shaped the postwar world and ushered in the first chill of the Cold War years ahead.